I’m a sucker for publications, real or imagined, that appear around Walt Disney World and throughout the resorts history. When it comes to fictitious publications, most often they emerge only in clippings posted to bulletin boards. Case in point, this section from the Southern Isles Gazette (we do love a good gazette around these parts). The excerpt includes one short story featuring Hans and two advertisements that give guests a glimpse into what the Southern Isles has to offer aside from a bratty prince with 12 older brothers. 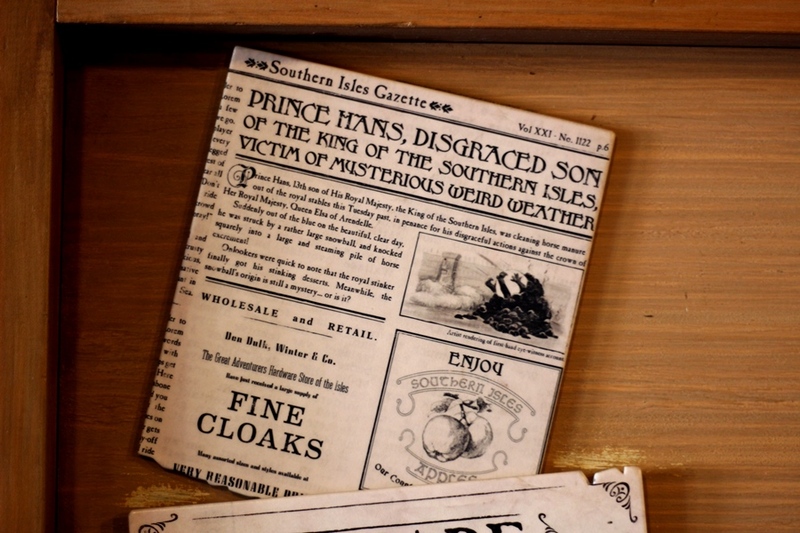 The main article relates the tale of how Hans, recognized as the “disgraced son of the king of the Southern Isles,” was cleaning horse manure as part of his punishment for his abhorrent behavior while visiting Arendelle in an official capacity. Although it was a beautiful spring day, he was suddenly struck by an oversized snowball and sent flailing into a pile of manure. The story is accompanied by a drawing with the caption, “Artist rendering of first-hand eye-witness account,” which I find particularly funny. 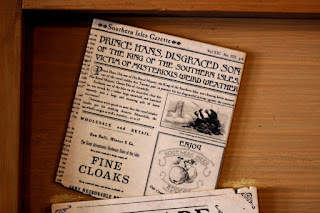 The story from the Southern Isles Gazette expands briefly upon Hans’ scene from the 2015 short, Frozen Fever. In the cartoon, Elsa unwittingly creates and sends the snowball across the map by sneezing into the Birthday Horn while attempting to play it for Anna’s birthday even though she has a cold. Viewers of Frozen Fever are the first-hand witnesses as we do see the snowball strike that delivers Hans into a manure heap. The advertisement in the bottom right is for Southern Isles Apples. The slogan for the apples is, “Our Country’s Most Enjoyed Export.” Perhaps this is a nod to apples having such a prominent role in Disney animation history, we’re looking at you Snow White, but it is definitely a slight to Hans. When produce is looked upon more highly than you are, you have definitely got some atoning to do. The last advert is for a supply of fine cloaks that have just arrived in the Southern Isles, a must if you’re venturing into Frozen territory. The Great Adventurers Hardware Store of the Southern Isles is overseen by Den Dulk, Winter & Co. The winter reference is fairly obvious, especially in a posting for cloaks, but Den Dulk is a wonderful nod to Michel den Dulk. Michel is the Imagineer who oversaw the design for the attraction’s conversion from the Maelstrom to Frozen Ever After. He came to Imagineering in 2009 to work on the redesign of Disneyland’s Fantasy Faire after acting in a design capacity at both Efteling in the Netherlands and Germany’s Europa-Park. All-in-all this brief glimpse into life in the Southern Isles via the Southern Isles Gazette definitely lets guests know that there is more to the kingdom than what Hans projects. In fact, it would appear that Hans is one of the more rotten pieces of the country and that the citizens there are much more amiable than how they are represented by a single prince. Newspapers and their ads are a great way to build worlds for an attraction, especially one such as Frozen Ever After that has a fairly long line on most days. We love to hear from our readers! Especially if you've just gotten one little spark of inspiration! Send us your comment, questions, story ideas, and corrections (we aren't perfect after all). We are always ready to hear what you have to say. Drop a line to our editor, Ryan P. Wilson, any time.